Vacation in the Sunny (and stormy) South! 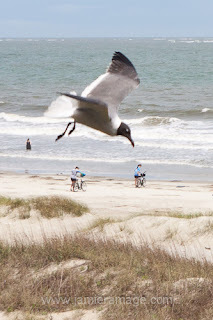 For the last week, Elizabeth and I have been vacationing at Hilton Head Island, South Carolina. We are right on the beach. It's exciting for me because I've never done this before (sit and watch the ocean from 'home'). For most of the week, the wind has been blowing along, or in from the water (all the big storms thankfully passed by us each time, but we have had some wind). As a result, we've not been taking a whole lot of photo's. I learned years ago while working in a camera store, just how quick and nasty ocean air can ruin a camera. Even if you don't feel the pray, it is there! I've had to clean my glasses at least twice a day, just so I wasn't looking through a 'fog'. Imagine caking that on a camera - over a week! We also saw dolphins (it was high tide, so they were only about 500 feet away from our balcony). That was a first for both Elizabeth and I. Oh, sure we've seen them in marine shows, but never in their natural habitat - and SO CLOSE! Tomorrow we go to Savannah to see where 'Midnight in the Garden of Good and Evil' took place. The house has been found and 'marked' in our GPS, as have a few other Savannah sights. We hope to get a bunch of nice shots of the gardens and architecture while there.